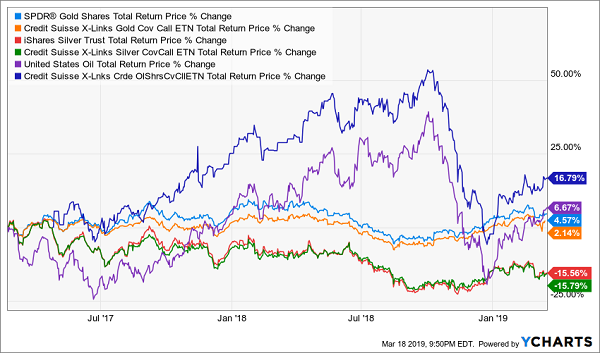 The real estate industry is getting pricey, too, with the iShares U.S. Real Estate ETF (IYR) yielding a five-year-low 3.1%. Many closed-end funds are no longer trading at the nice discounts to NAV that they were even a year ago. Thus, my hunt for significant sources of yield has taken me to some interesting (and even downright odd) corners of the market that the financial media has largely ignored, and that most investors haven’t even heard of. Their yields are eye-catching, sure – who isn’t going to notice yields of 6%, 14.3%, 16.7%? But their unique business models are just as captivating. These companies deal in odd businesses which not only make them difficult to properly value, but in many cases also means they’re dealing with far less competition than more mainstream stocks. Of course, none of these hold a candle to the massive 14.3% dividend being thrown off by Vector Group (VGR), a unique tobacco-real estate hybrid that truly has no equal in the publicly traded world. Vector Group is actually a holding company that features two very disparate arms. Its Vector Tobacco and Liggett Group subsidiaries include brands such as Even, Pyramid, Liggett Select and Eagle 20’s discount cigarettes. However, VGR also owns New Valley, which owns real estate investments in California and New York, among other places; real estate brokerages in several states; and a 100% ownership in Douglas Elliman Realty LLC, New York City’s largest real estate brokerage. To Vector Group’s credit, the company has kept revenues growing for years despite pressures on the tobacco industry. 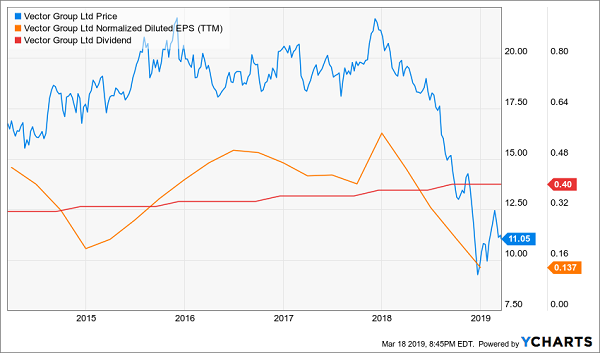 But net income dropped precipitously from 2017 to 2018, from 56 cents per share to 37 cents per share. And perhaps importantly is that an ongoing dividend concern – a payout that wildly outstrips its means – persists, just as it did two years ago when I last covered the stock. The company paid out $1.54 per share in dividends last year – more than 4x its profits – as it stubbornly continued to increase its quarterly dole. 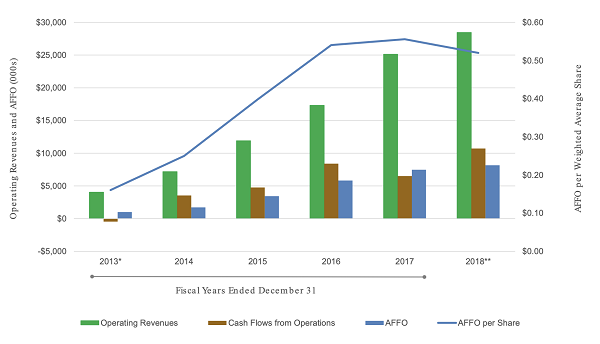 The cash situation is technically better but not good, with dividends at 124% of operating cash flow for 2018. While VGR’s combination of tobacco and real estate would seem to be a can’t-miss dividend play, its risky financials make it a clear yield trap. Speaking of real estate, investors also are plenty familiar with the income potential from real estate investment trusts (REITs), which have to take 90% or more of their taxable income and deliver it right back to investors as dividends. Many of these REITs are in pretty straightforward industries – retail, hotels, warehouses. But sometimes it pays to delve into areas that few other operators are interested in. For instance, there’s Gladstone Land (LAND) – part of the Gladstone family of investment vehicles – which owns 83 farms primarily dedicated to growing food, spanning 68,777 acres across nine states. It’s a no-brainer investment as the world population (and its demand for food) grows but arable land per capita continues to shrink. While it sounds boring, it’s a high-potential category – revenues have expanded by 6.6x since Gladstone Land’s 2013 IPO; cash flows and adjusted funds from operations have exploded, too. LAND yields 4.4% at the moment. Entertainment (48% net operating income): This includes 158 megaplex cinemas under the Regal Cinemas and Cinemark (CNK) brands, among others, and a few family entertainment centers and entertainment retail centers. Recreation (32%): This is EPR’s most interesting category, containing not just traditional entertainment venues such as water parks and ski areas, but also innovative TopGolf driving ranges (upscale, multi-deck ranges that “gamify” golf and boast an almost nightlife-esque atmosphere) and iFly indoor skydiving facilities. 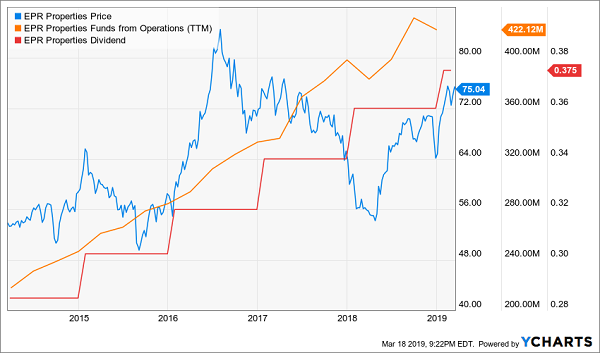 EPR appeared to hit a bit of a growth wall in early 2018, but FFO have rebounded, and the dividend keeps growing. With few disruptors in sight, EPR’s fate is mostly in its own hands. Gold doesn’t pay a dividend. Neither does silver. Neither does oil. Commodities don’t generate profits or cash flow, and they never pay out a single dime to shareholders. And yet, Credit Suisse (CS) still offers a few products that can squeeze dollar bills out of metals and crude. … it’s actually been a significant underperformer (7 percentage points!) in the past year. That’s because while selling covered calls does generate a high amount of income, it can put a significant cap on price-performance upside. Moreover, these indexed products use very limited options-trading techniques that make it difficult to maximize the utility in trading covered calls. The result? Flashy yields with very little substance to set them apart from cheaper plain-Jane commodity funds. How to Retire Entirely on Dividend Checks Alone! If you’re getting a three-year return of 16.7% from a fund that yields 16.7%, something has gone terribly, terribly wrong. And that something is your retirement. If you want to meet your financial goals, you need to identify high yielders that can not only sustain high payouts over time, but also grow them (to outpace inflation) and give you some price performance on the side. Remember: If your nest egg isn’t growing in retirement, and you have to raid your account to cover an emergency, you’ll cripple your ability to generate income. That might sound ambitious, but you can check off all three boxes with the “triple play” stocks in my 8%-yielding “No Withdrawal” retirement portfolio! There are far more dangerous dividend stocks out there than you’d think. 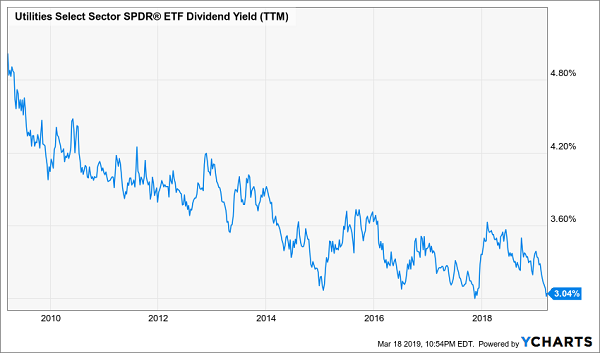 You probably already know that a lot of super-high-yield stocks only deliver that level of income because of battered share prices that reflect deteriorating businesses. But you should also beware a lot of big-name blue chips that seem safe, but whose no-growth businesses and modest yields can actually set your portfolio back years. The financial media tells you these stocks are protecting you, but really, they’re quietly pulling you underwater. Consider this: If you’re earning a 3% yield on your portfolio (that’s 50% more than the S&P 500), and what you’ll typically get from “high-yield” blue chips, you’ll earn just $30,000 a year in dividends on a million-dollar nest egg. If that made your heart skip a beat, good – it should! That’s your wake-up call. 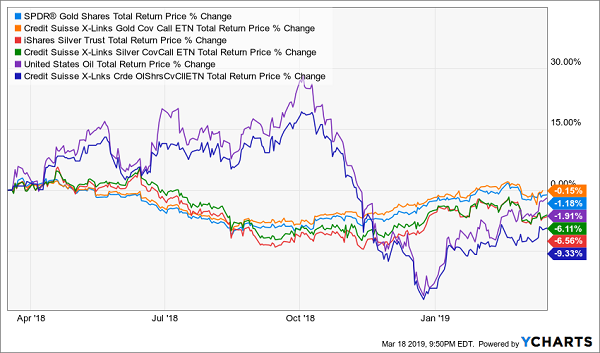 My “No Withdrawal” portfolio is an all-star cast of stocks that will deliver an average yield of 8% that will also grow your nest egg – an important aspect of retirement investing that most other strategies leave out. If disaster strikes and you have to take a chunk out of your nest egg, you’re also taking a chunk out of your income potential. You need income and growth. This portfolio will give you exactly that. You’ll be able to live off your regular dividend checks alone, and you’ll never have to touch your nest egg just to pay the bills. You worked your tail off for years. 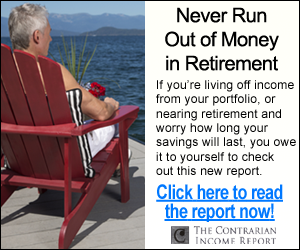 Let me show you the way to the comfortable retirement you’ve earned. 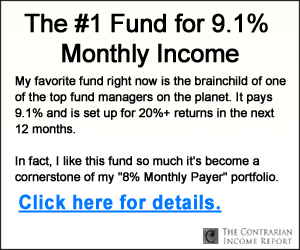 Click here and I’ll provide you with THREE special reports that show you how to build this “No Withdrawal” portfolio with an average 8% yield. You’ll get the names, tickers, buy prices and full analysis of their wealth-building potential – and it’s absolutely FREE!